October is a great month to travel, mainly because it sits between most places’ high and low seasons, plus you get the chance to celebrate Halloween in a different country! Check out this list of the best holiday destinations in October and get your passport ready! The long hot summer days are long gone, yet the cosy wintry ones seem far away. Even if you’re down under, you’re still squashed between the two seasons. 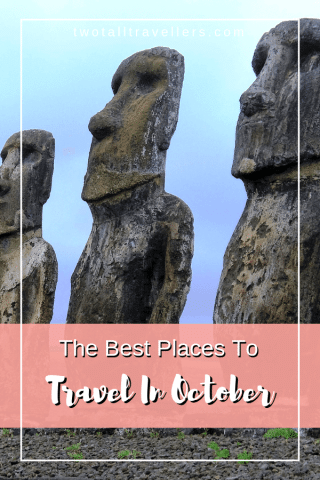 October usually doesn’t tickle the travel in most of us, but it really should! We’ve listed, in no particular order, some of the best places to visit in October for you to pick from. There are cute European towns, a remote Pacific islands as well as potentially the most magical place on earth. Where will you go this October? Pretty decent place to visit in October! Have you ever considered visiting Croatia? How about Easter Island? You can find a quick description of these places and more in this list, as well as the top tours to enjoy whilst you’re there and the best places to stay for all budgets! Click on the links to read the place you’re most interested in visiting or look through the whole list to get some inspiration for somewhere to travel that you have never considered before! If you’d rather use AirBnB than stay in hotels, click here for $40 off your first stay! 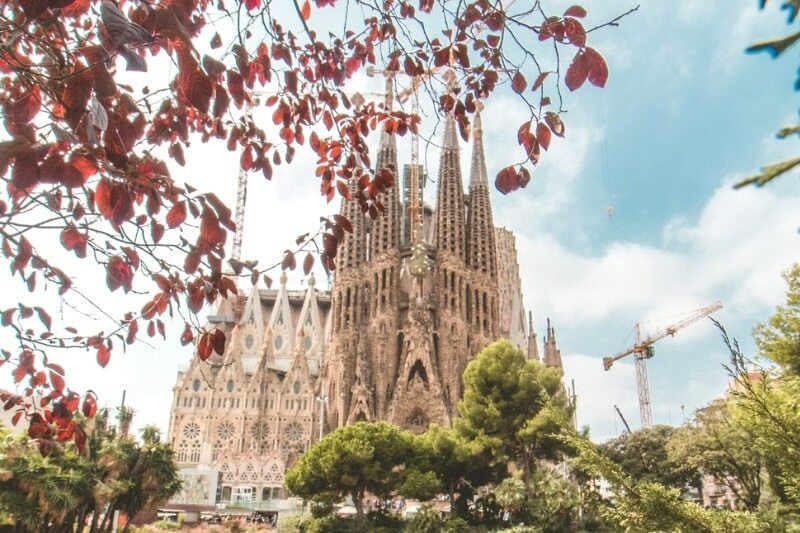 The great thing about Barcelona is that it is easily accessible by so much of Europe but what that can create is a problem around accommodation and especially during peak season. how awesome is this cathedral?! What is so great about the city is that even going in October it was pretty warm, around the mid to high 20s (Celcius not Fahrenheit). Going in October which is what I would call a shoulder season means there are fewer people and more of a chance of you getting to stay in better parts of Barcelona for a little more bang for your buck. One thing I really appreciate in Barcelona is that all the touristic sights are spread out across the city. This means when you walk between them you really get to feel and experience the beat of the city, and you get to enjoy this so much more when you don’t have to walk through hoards of people. See more from Flunking Monkey on Instagram! 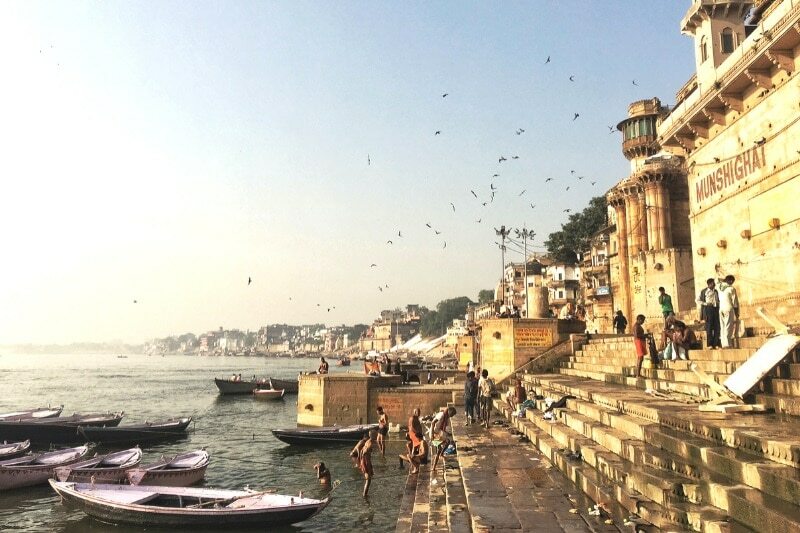 Varanasi is one of the best places to visit in India. It’s also one of the best holiday destinations in October. It’s a perfect time to visit, for the weather is dry and the days hot, but not suffocating. It is a really gorgeous city that has a lot to offer to visitors. Varanasi is the cradle of the Hindu religion and considered to be a holy place. Like many other places in India, it is crowded and chaotic. Yet, among the chaos, it is possible to find some really quiet and peaceful corners. One of the nicest things to do in Varanasi is taking a walk in the narrow alleys of the Old City – they are so narrow that cars can’t go through, and so it is really quiet compared to the rest of the city. Walking along the Ghats is a must, and, at night, attending the Ganga Aarti ceremony at Dashashwamedh Ghat: during the wonderful ceremony, fire is donated to the Mother Gange. The funeral ceremonies can be observed during a sunrise boat tour. Keep in mind that taking photos of cremation ceremonies is not allowed. Varanasi has plenty of good sleeping options. Marigold P. Guesthouse is located in the Old City. It has modest but comfortable rooms, and the owner Sonu is very welcoming and helpful. Among the recommended places to eat there are Spicy Bites and Bona Café. The best lassi is at Bana Lassi. Bhang Lassi (which is made with an extract of flower heads and leaves of cannabis) is best at Blue Lassi, which is just a small hole in the wall outside the Old City. I used to live in Albuquerque and it is a great city to visit in the autumn. It’s one of the best holiday destinations in October as this is when the Albuquerque Balloon Festival takes place each year. 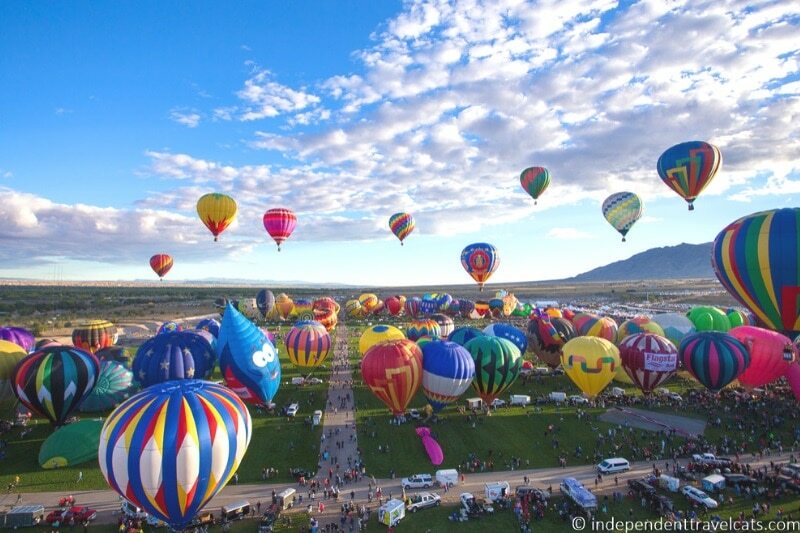 The Albuquerque International Balloon Fiesta is the largest annual balloon fiesta in the world and during the 10-day event, you can watch hundreds of hot air balloons take to the skies. It is one of the most colourful and most photographs festivals in the world and I am lucky to have been there twice now. £50 to anyone who can guess how many balloons are in the picture! But there are also other reasons to visit Albuquerque in the autumn as it is also green chile roasting season (green chiles go great on burgers, burritos, and in stews) and it is when the trees start to turn to autumn shades of yellow, orange, and red. There are of course loads of year-round things to do in the city, and I’d recommend first-time visitors leave time to explore the Old Town, take the Sandia Peak tramway, visit the Albuquerque Museum, eat in New Mexican restaurants, and go hiking at Petroglyph National Monument. Santa Fe, one of the country’s top art destinations and oldest cities, is also only a short drive or train ride away if you are looking for an interesting day trip. See more from the Independent Travel Cats on Instagram and Facebook! Easter Island is a tiny volcanic island located in the middle of the Pacific Ocean in the Polynesian triangle. It is a territory of Chile and can be reached by a flight from Santiago. Easter Island might be a bit eerie but it’s also so fascinating! This small, remote island is very popular with tourists because of its ancient stone statues called the Moai or the Easter Island heads. 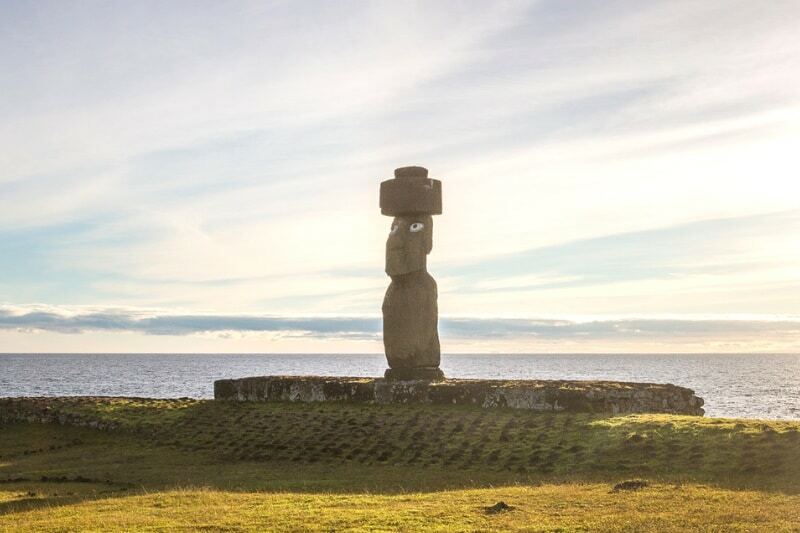 The statues are a UNESCO World Heritage Site and are protected by the Rapa Nui National Park. They were built by the ancient Rapa Nui people that inhabited the island a long time ago and lots of mysteries surrounding the statues. Apart from seeing the enigmatic Moai and other archaeological sites, Easter Island also offers many other things to do including snorkelling, scuba diving, horseback riding, and seeing traditional dance performances. The island is located in the Southern hemisphere and the cold winter weather ends in August – September. It’s one of the best holiday destinations in October since there are very few tourists and hotels, as well as activities, are offered at a discounted price. The water temperature in October is also ideal for swimming, surfing, and other water-based activities. See more from Dotted Globe on Instagram and Facebook! Formerly known as Histria, this western Croatian peninsula is the largest in the Adriatic Sea. It has a variety of different climates such as continental, Mediterranean, and oceanic, as well as various geographical features such as mountains, rivers, and valleys. 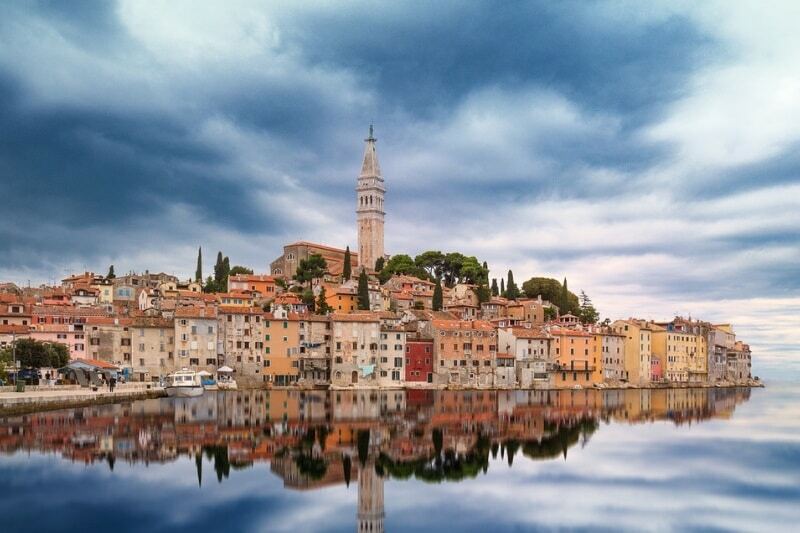 Istria is becoming quite a popular tourist destination and it’s easy to see why. The beautiful peninsula offers many scenic views, picturesque towns, and comfy hotel beds. Getting there is fairly easy – you can fly straight to the airport in the town of Pula, or to one of the nearby airports in Italy. Istria is one of the best holiday destinations in October for a number of reasons. For one, the lack of tropic temperatures if that’s not your cup of tea. Also, the fall months show stunning colours on the local vegetation, giving you many excellent photo ops. There are also many local events in October, such as Truffle Days every weekend, the Marunada chestnut festival, the Pula boat fair, and a Brandy Festival in Hum, the smallest town in the world. See more from Nylon Pink TV on Instagram and Facebook! Fall is my favourite time to visit Disney World because of the combination of great weather and two of my favourite events. 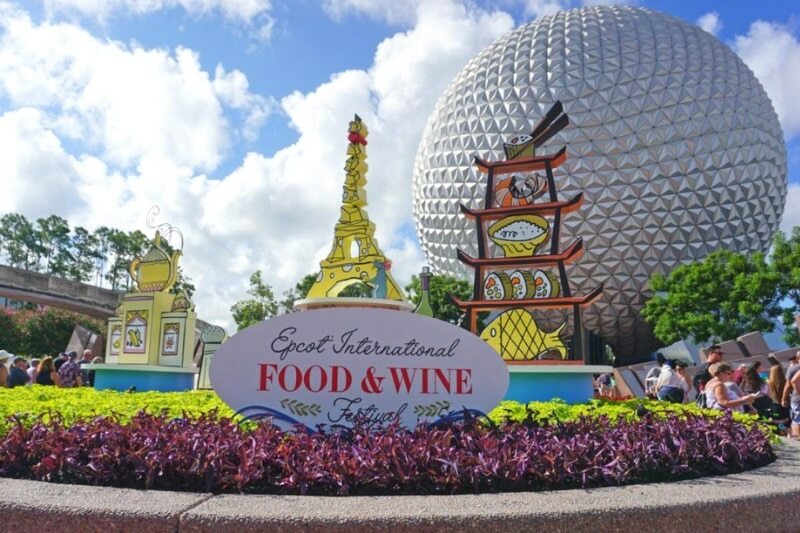 The Epcot International Food and Wine Festival kicks off around Labour Day each year and features kiosks serving amazing small plates and boozy drinks from around the world. The regular Epcot pavilions are represented, and additional countries like Australia and Brazil are added to bring extra flavour. It’s the perfect grown-up event for Disney parks. If you’re more into Halloween, Mickey’s Not so Scary Halloween Party runs on select evenings at the Magic Kingdom throughout September and October. This special after-hours ticketed event features an exclusive parade, fireworks presentation, and Hocus Pocus themed stage show. Adults and kids can also dress up in their favourite costumes and trick or treat at designated spots around the park. Rare characters make an appearance for a meet and greets with guests – you even have a chance to get a photo with all of the Seven Dwarves at once. See more from Nomad By Trade on Instagram and Twitter! 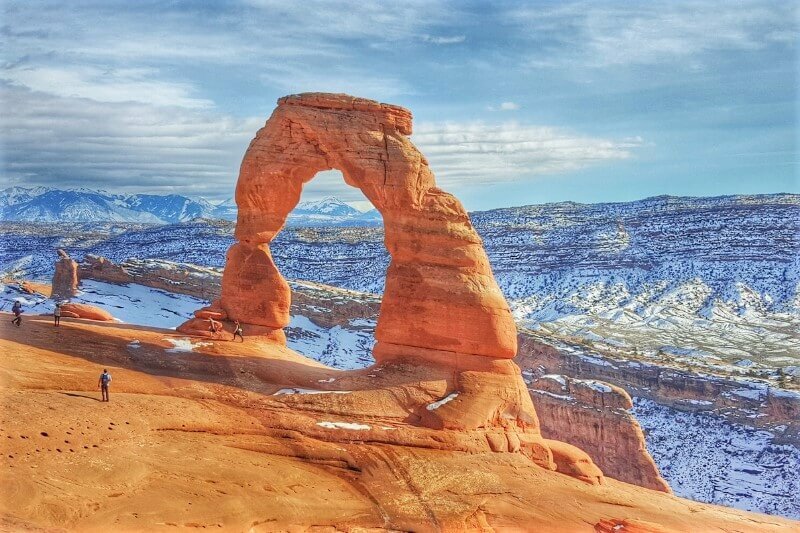 I bet you never thought about going to Utah in October because most people think of skiing when they think of Utah but October is the perfect time to visit the Mighty 5 National Parks. The crowds are minimal, the weather is perfect, and you can get some great travel deals. If you want to see the 5 parks (Zion, Bryce, Capital Reef, Canyonlands, and Arches) all in one go I recommend flying into Las Vegas, renting a car, and driving the scenic route from one park to the next. 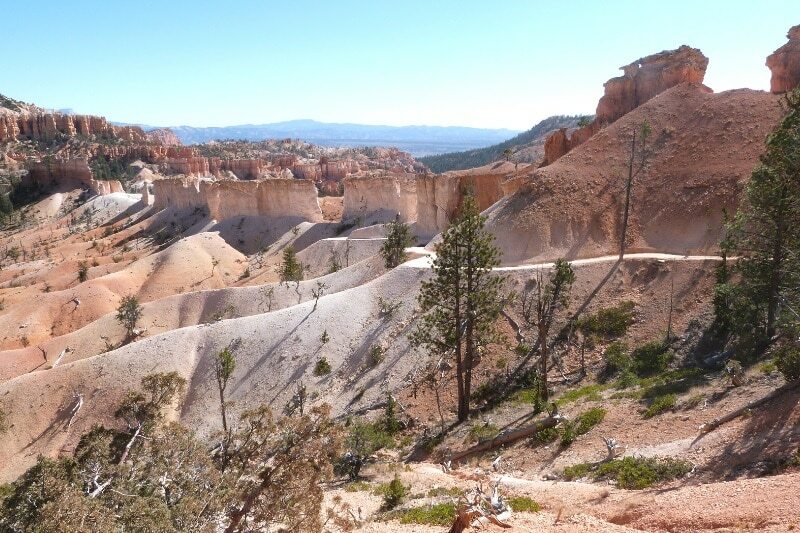 For the 2 biggest parks (Zion and Bryce) there is a shuttle to take you to the trails and in the summer, you can end up waiting several hours for a shuttle but in October there is virtually no wait. Once on the trails, if you like them a little more strenuous, you may not see another person for long stretches of time. It’s the best way to experience these parks, without the stress of being overwhelmed by people. It’s just you and some of the best scenery you will ever have the privilege of witnessing. Are you travelling in October? Let us know your favourite place to go!